interests | .How the Fairies Roam. .How the Fairies Roam. Little Writings. Some Rants. You’ll know the ones I mean. Blonde hair, blue eyes, broad shoulders. Football players, baseball players, wrestling. They laugh hesitantly, cracked smiles. As if you pleaded for me to crack open that hard exterior. Or maybe you were longing for something that I had. I don’t think you were interested in me. I think you were interested in what I had. Maybe you secretly watched Japanese cartoons. You’d never be able to tell another soul. Those eyes pleaded with me to find your secret. The loudness in your gaze. I wonder if you grew up well. I don’t even remember your name. I wonder if it ever set you free. So, I’ve been meaning to talk to you guys for awhile now about inspiration and my muses. I’ve created and (accidentally) destroyed two or three different drafts of discussions and I’m deciding I should just combine them. So… Let’s talk about my muse, shall we? My writing muse is literally my OC. He’s a fiery (literally… and, of course, stereotypically…) and brooding individual that really (ahaha) fires up my world… Which makes me seem a little crazy but bear with me. 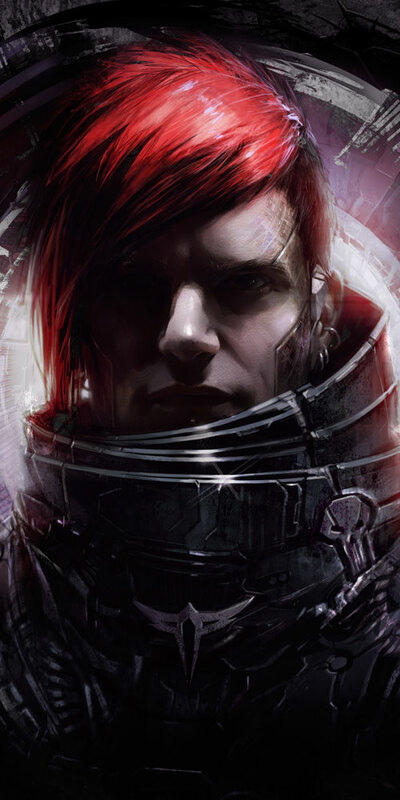 Cover art of the Celldweller album, End of an Empire. I do not own this artwork. So I’ve been writing The Book since middle school. Long before Celldweller dyed his hair red and published his album, End of an Empire. But let’s be fair… he looks like Merrikh. sans hair flip. sans… well… actually… he’s pretty close to how I’ve always envisioned Merrikh. Merrikh just has more tanned skin… and fancy ears. Cuz… he’s an alien.